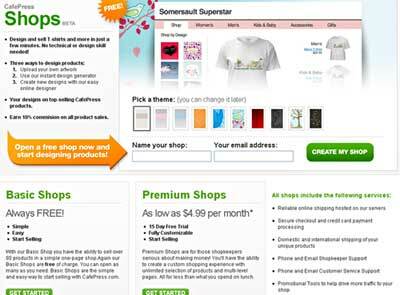 To get the most out of your CafePress Shop you will need to take additional steps. But this will cover the minimum requirements. These steps assume you already have an account. Start on the Your Shops tab. To create a new shop select Open A New Shop. If you already have a shop select Sections / Products and start on step 4. Type in a shop name. Type in a shop_id. This will be part of your shop address link. I don't think it much matters how you answer the Tell us a little about yourself questions. Marketplace, Affiliate and Shopping Channels Opt-out - Think carefully before you decide to opt out. Failure to understand marketing is probably the single biggest reason for lack of sales when the designs are good. Let someone help you with that and reward them when they succeed. Private - If you don't want your shop to be indexed by search engines check this box. You should be on the Section Info tab. If not, choose that tab. Type in a descriptive Section Name. For the Section Description type in text that describes your topic area, your design, and something interesting about it - maybe what inspired it. Choose your section image. You can use the same image you are going to put on the products. Create a descriptive default product title - it should be about the design, not the product. Type in the default description that helps a person picture your design before they can see it. If you were trying to find out if another person was using a similar design what words would you use to search on? Use those words. Choose your default image - the one that will fit most of the products you will choose. Choose your markup. Note this price will only apply to sales you drive to your shop. It will not apply to products sold through affilates or the CafePress marketplace. For each product group choose the Make Selections link so you can see how the design actually fits on the product. A very ommon beginner mistake is to apply images to products that don't work well with the image. Make sure your image fits the product properly, and that it looks good. Don't be afraid, though, to add products that look good but you think people might not buy. People have different tastes. See the information on image sizing. Click the Preview This Page button to see your shop. See the video demo Quick Start on a CafePress Basic Shop or Set-up a CafePress Basic Shop This is an older version so some of it is out-dated but it will give you the general idea. There is plenty to learn and a lot to do. Your work and time spent will pay off best if you start with those things that will make the most difference in selling. Setting up the defaults (Storefront Info tab) does not affect existing products but can save time creating new products. You don't need to fill in all the defaults. For example, you can just fill in the markup , product name and product description, leave the image blank, then choose the image as you are adding the products. Understand the basics of trademark, copyright and rights of privacy/publicty. That will save time by not getting into designs that will end up getting pulled. Make sure your graphics program is up to the task. Some people succeed with lesser programs but it costs them time and frustration. There are several free ones that are suitable. GIMP is not easy, but it is free. Make sure you understand image sizing and color selection. Nothing like spending lots of time creating designs only to find out that they won't work and you have to redo them. Your sales will depend on the text you write for the top of every page, product descriptions and product titles. The text should be descriptive, not a sales pitch. Write a word picture of what you are offering. You are on the telephone to your significant other. You want to tell them about this really great shirt you saw, and you want them to buy it for you. You don't know where it came from. Describe it so that they can find it for you. Skipping this is the same as hiding your products and saying you don't want sales. Includes the name of at least one of the objects in the design art. Set aside shop customizing for while. Shop customization is fun but not as important to the customer as those other things. By the time you've gotten rolling on the critical stuff you will have had time to start getting oriented on HTML etc. This shop type was announced in May 2010 with the description that it was created to serve "1) people who want a shop for fun, 2) a group/organization or 3) someone with a website or blog with the goal of making the process of opening a shop super simple." That announcement offered a link to the details and FAQ page. Here is an example of a basic shop, limited Beta shop, and premium shop. To keep it simple it is more limited than than a basic shop in setting prices (you can't), choosing products (you can't), being in the marketplace (it isn't), linking directly to a product (you can't), putting a link out in the shop header banner (forget about it), putting designs on the back of anything (nope, not that either)... etc. There are a few ways in which the "Shop" is less limited. It has an on line designer and clip-art library. It allows up to twelve design groups. And .... well that's all I can think of. . A more detailed comparision is here. Eventually they hid the link for basic shops (although you can still create them) and the limited basic shop, leaving only Premium shops - then dropped the "Premium from the name. Apparently the beta shop can still be created by people opening a webs.com account.